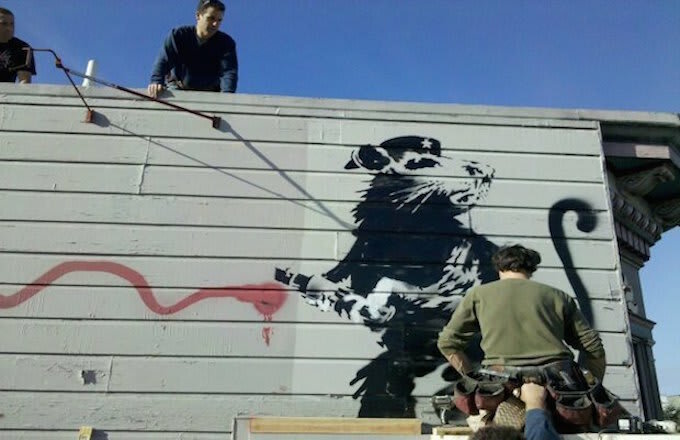 Street artist Banksy&apos;s stencil of an artistic rat wearing a beret appeared on the side of a building on Haight Street in San Francisco back in 2010. The art was removed by a team of professionals shortly after by order of the city, and the "Save the Banksy" campaign was launched to have the piece restored and stored until a permanent, public home could be found. According to The San Francisco Appeal, the mural has been shipped to various places over the past four years, including Miami and Los Angeles, but it has spent two of those years in storage. Next week, the "Haight Street Rat" will finally return to San Francisco where it will be installed in the 836M window, four miles away from its original location. It&apos;s not exactly a return to the concrete jungle, but it is a fair compromise. San Francisco Weekly writes that because it was painted on the street, there are no authentication documents for the mural, which threw a wrench in "Save the Banksy" founder Brian Greif&apos;s plan to have it acquired by a museum. Installing it in the window of 836M allows everyone to still have access to the piece without having to enter the potentially uncomfortable space. "Haight Street Rat" will be installed on Jan. 21 and will remain at the gallery through July 11. There will also be Banksy-related programming, including lectures and other events. Hit the 836M website for more info.